The gallbladder is a small pear-shaped organ that stores bile. Gallbladder removal surgery actually removes inflamed or obstructed gallbladder, particularly if there is pancreatitis caused by gallstones or if cancer is suspected. Surgery to remove the gallbladder is called cholecystectomy. There are two ways of performing this surgery: open cholecystectomy and laparoscopic cholecystectomy. Cholecystectomy is done under general anesthesia. Laparoscopic cholecystectomy usually involves four small incisions and the use of small camera called laparoscope. The laparoscope is inserted into body through the incision made just under the navel. 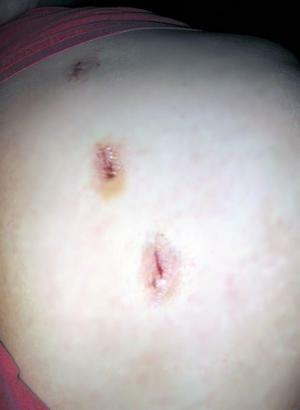 The other 3 cuts, made in the right upper part of the abdomen, are used for putting surgery tools. The gallbladder is taken out through one of incisions. Open cholecystectomy is performed in complicated cases. This method requires single large incision just bellow the ribs on the right side of the abdomen. As with any surgery performed under general anesthesia, there is a risk connected to reactions to medications or difficulty breathing. Risks of cholecystectomy include hemorrhage, infection or injury to the common bile duct. After the gallbladder is removed, the bile tends to accumulate in the liver since bile storage space is lost. Reduced bile flow leads to indigestion, constipation or diarrhea. Also accumulated bile impairs liver function. All of this may cause insomnia or bad breath and even depression. Additionally, reduced bile flow may weaken the spleen and pancreas. Pale yellow diarrhea is one of the most common side effects of gallbladder removal surgery. Diarrhea occurs because the liver produces and releases more bile salts and the intestines can not absorb them. Unabsorbed bile salts can prompt the colon to secrete fluids which results in diarrhea. Commonly, gallstones can be formed in the liver due to congested bile in the liver. “Post-cholecystectomy syndrome” refers to symptoms such as right-sided abdominal pain, flatulence, bloating and nausea. Cause of these symptoms is unknown and they are not related to the surgical procedure. Gallbladder removal may result in auto-immune diseases and allergies due to poor liver and spleen function. Other problems after gallbladder surgery include rash, arthritis or anemia. Gallstones can be removed by gallbladder flush (chemical dissolution). European traditional folk remedy uses combination of olive oil and lemon juice to flush the gallstones. Chinese traditional medicine recommends the use of plant called Gold Coin Grass. This plant helps to soften and crush the gallstones in order to flush the stones more easily. Flushing is a process used to clean out the stones.